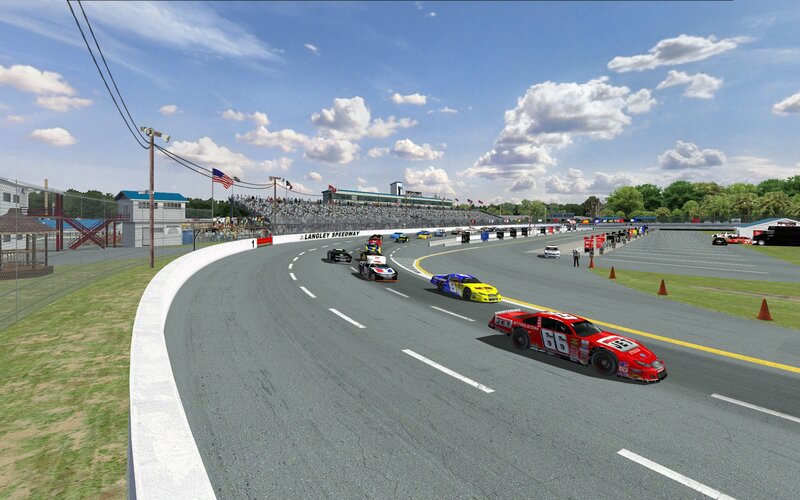 This latest PST offering manages to fill yet another void in the popular NR2003 short track landscape enabling sim enthusiasts running WSMT and K&N Pro Series schedules to now include a nice modern day version of Langley Speedway to race on. Before we go any further in this release announcement, we want to recognize the outstanding modeling work of Wayne “Bowtie” Anderson in this project. Practically every object you see in these versions of Langley was meticulously crafted by Wayne. We poured through countless photographs and videos for reference materials in an effort to get every object as realistic, scaled and detailed as its real-life counterpart. Wayne most certainly helped accomplish that goal through his tireless efforts and extraordinary skills. Thanks Wayne. 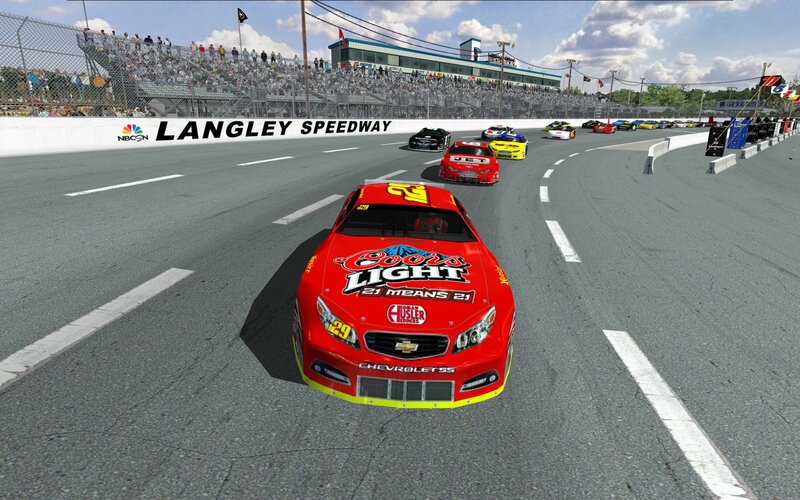 This NR2003 version of Langley Speedway is an accurate 0.396 mile asphalt oval with “flat” (6 degrees) banking in the corners and infield pitting for 27 cars. 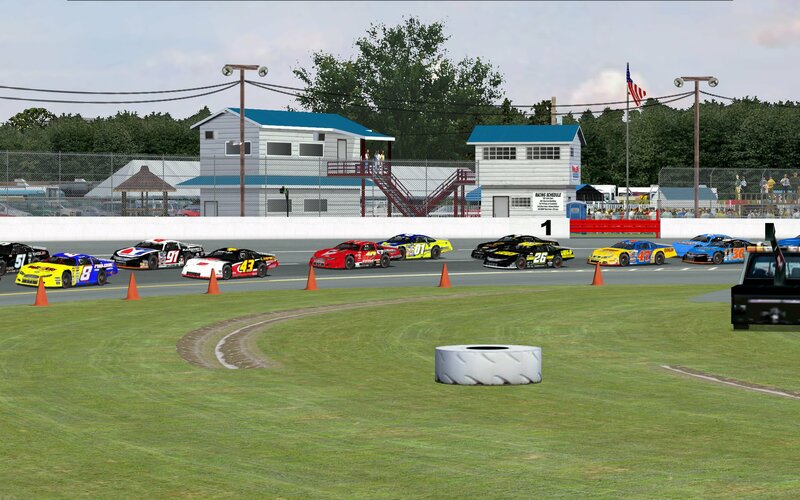 The track has 2 racing grooves, but the preferred groove is the low line. 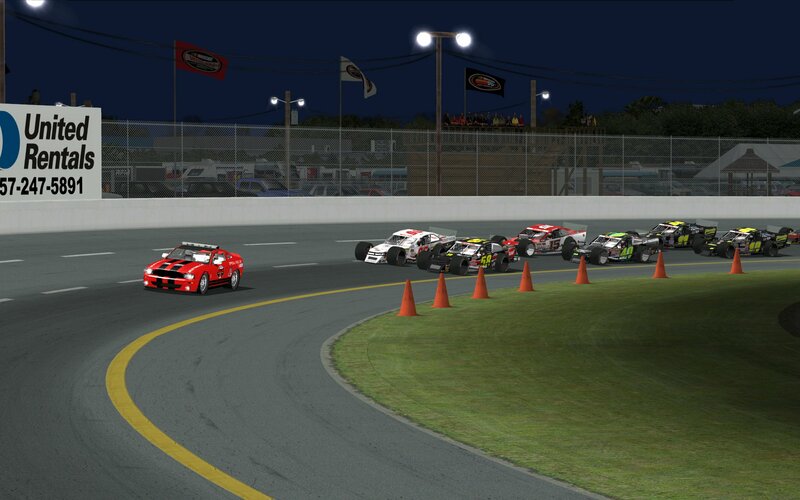 Making a pass on the outside will require an exceptional setup and “alien” driving skills. However, with that being said, ride the low groove for all it’s worth… but don’t think for a minute that the A.I. on your outside is going to give it up easily! 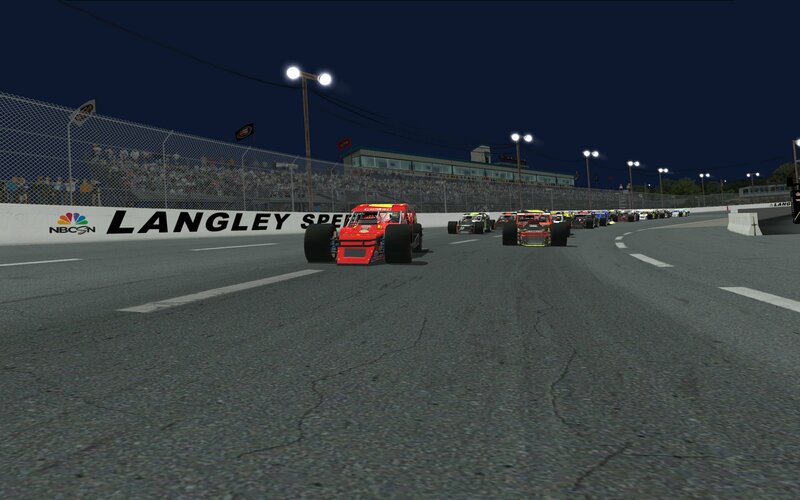 Almost all of the events at Langley Speedway are run at night, so that is why we felt it most important to hold off the release of the track until a night version could be cobbled together. 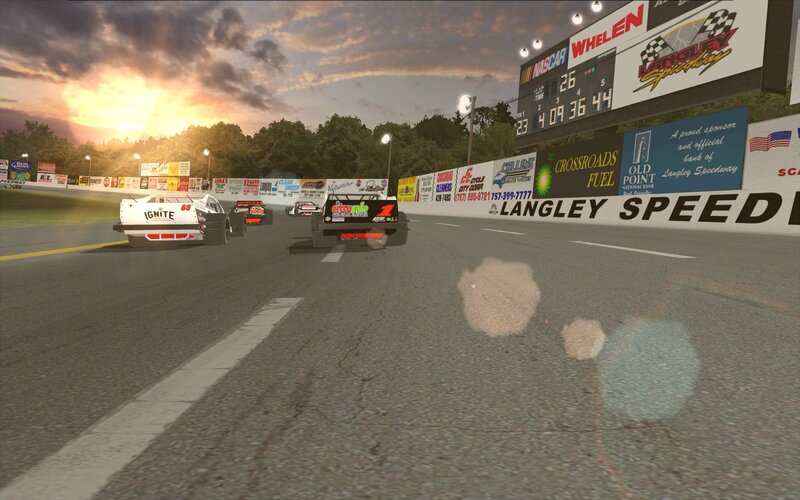 Creating night versions of tracks for NR2003 can sometimes be a very daunting task to get the environment to look just right, but once it’s done… MAN they are just so darned fun to race on!!! We hope you’ll agree. There are a few other people and PST members to thank who also leant a helping hand in this project. Please be sure to read about all of their contributions in the CREDITS README file provided with the track. We also want to recognize former PST member, John Hopkins, who started the scratch-built Langley track project back in 2013, but unable to take it much further than its base layout, handed it off to the team. We hope we have done him proud in helping to bring his initial concept to completion. As with all of our tracks there are some very important notes in the README file about the A.I. and how to get the best results when racing on the track. 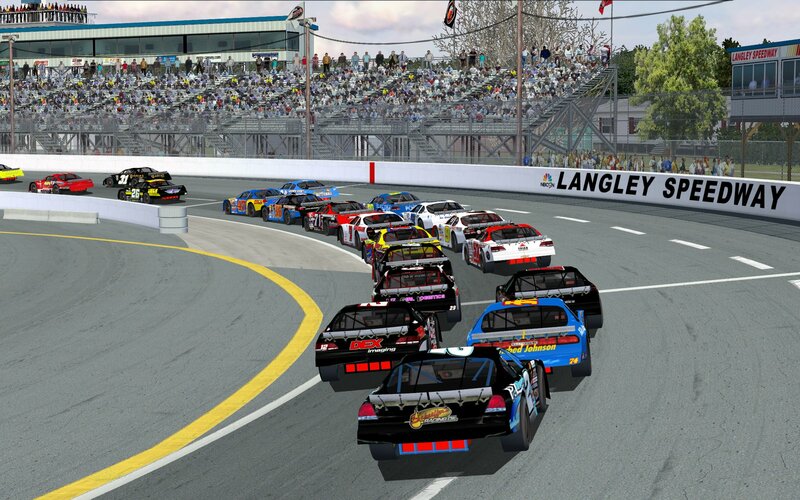 Now that all the formalities are out of the way, it’s time to get down to some serious short track racing… “Southern Style”! Enjoy. Mystical, dooper, horseman89 and 3 others like this.